Former Aberdeen striker Jonathan Smith is in line to make his debut against Stenhousemuir after his capture by Peterhead was confirmed. The 20-year-old came through the youth ranks at Liverpool before heading for hometown club Wigan Athletic. 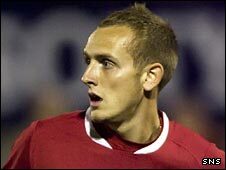 He joined Aberdeen in 2007 but made just one appearance as a substitute before being released. But the striker, who had a spell with Accrington Stanley, has won a deal with Peterhead after a successful trial. Winger Zander Sutherland, freed by Inverness Caledonian Thistle, is continuing his trial having played against Clyde and Alloa Athletic. However, Peterhead manager Neale Cooper has decided against signing Dundee United midfielder Marco Andreoni on loan. The Third Division club have themselves farmed out two young players for six months. Defender Cameron Bowden has joined Highland League newcomers Turriff United, while striker Ryan Duncan has joined North Region Division One junior champions Buchanhaven Hearts.